a form of madness involving the delusion of being an animal, usually a wolf, with correspondingly altered behavior. Since Lon Chaney Jr. first stalked the moonlit moors in the 1930s, the werewolf has long been the go-to metaphor for our internal struggle with our primal and violent nature. The Freduian id writ large, and hairy. 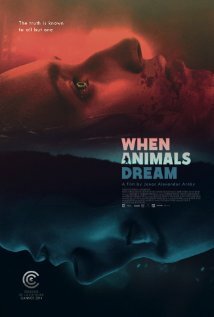 That tradition continues with the Danish coming of age horror-drama, Jonas Alexander Arnby’s WHEN ANIMALS DREAM. Marie (Sonia Suhl) is a teenager in a small fishing coastal village, working at the local fishery and living with her parents. 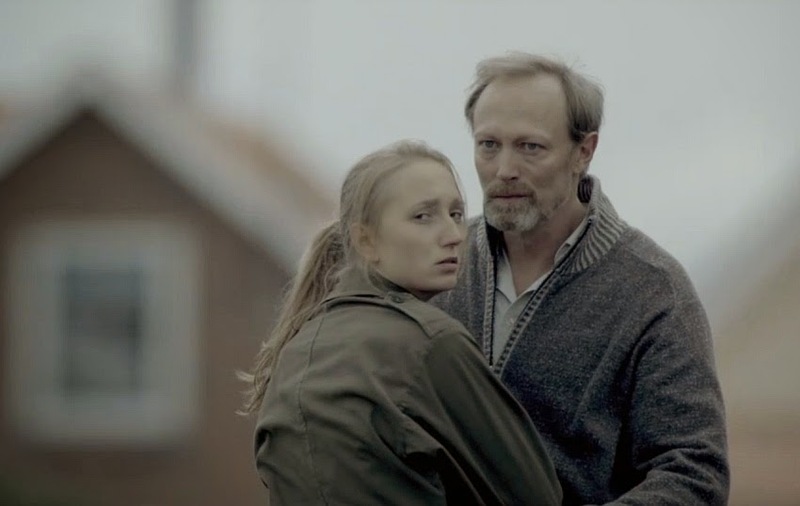 Her father (Lars Mikkelsen) is quiet, stoic but over-protective. Her mother (Sonja Richter) is near-catatonic, bound to a wheelchair and under heavy medication. Her co-workers regard her with an air of curiosity and outright hostility. Soon enough, she learns the secrets behind the townspeople’s leery nature towards her, secrets tied into her mother’s current condition that everyone else seems to know but her. Oh, and – of course – there’s also the matter of her ever-changing moods as well as the strange lesions and wispy strands of hair growing on her body. All of the standard allegorical tropes associated with werewolf cinema are covered here: rebellion, burgeoning sexuality and the perpetual parental fear of losing control of one’s child. Comparisons to GINGER SNAPS are unavoidable and fair, as WHEN ANIMAL DREAMS covers much of the same territory with its female perspective, touching on the struggle between patriarchal authority versus female independence. The difference here, though, is how it’s done and Arnby does so with a slow and steady hand. It’s a languidly paced film, more arthouse than funhouse. Dialogue is minimal, as are the gore and scares usually de rigeur with werewolf cinema. Marie’s eventual metamorphosis is gradual yet effective, with small tell-tale signs indicating her shape-shifting, and her inevitable acts of violence occur (more-or-less) offscreen. But there’s a dream-like quality in how it all comes together. Niels Thastum’s beautiful cinematography and the haunting score by Mikkel Hess are entrusted with much of the narrative thrust here, resulting in a quiet and dream-like resonance to many of the film’s key scenes told with nothing more than music and vision. That’s not to say that the cast gets to coast, though. Both Suhl and Mikkelsen are exceptionally good, creating a believable father-daughter bond with often nothing more than a look or a line of sparse dialogue or two. There is a moment near the end of the film, the last exchange between these two, that is especially effective and powerful, all perfectly conveyed with his final words to his “growing” little girl. The old adage about there being no new stories to tell is very true and there is nothing in WHEN ANIMALS DREAM that hasn’t been touched on before. But there are always new ways to tell them and once you get into sync with its hypnotic air, you’ll be rewarded with a novel spin on an old story.